The best way to learn about a new cuisine is from those born and raised in that country, and that’s why I have Pepy of Indonesia-Eats as the guest writer for Indonesian food today. Pepy is the first Indonesian food blogger I know and I’ve since learned so much about Indonesian cuisine from her blog at Indonesia-Eats.In this guest post, Pepy explains the different preparations of Gado-gado and shares with us her recipe. Please welcome her to Rasa Malaysia. To begin with, I was surprised that Rasa Malaysia has chosen me to be the guest writer of Indonesian cuisine on her blog. 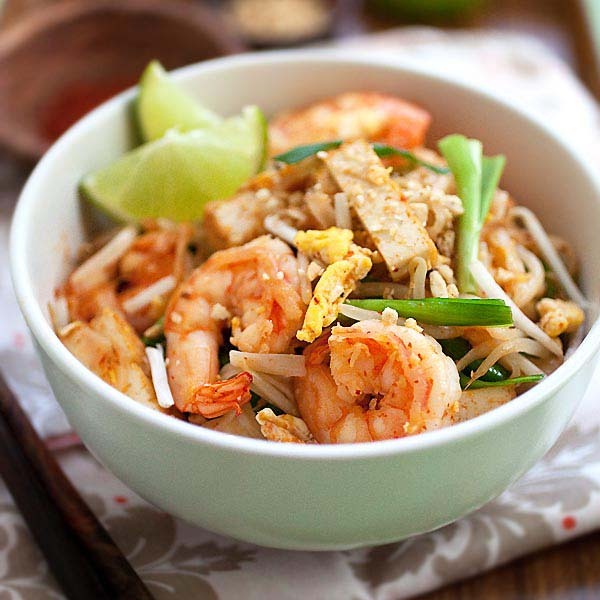 Rasa Malaysia is one of my inspired blogs among the Asian specialty blogs. We share the same passion for Asian food as we came from the same region, Malay Peninsula where Bahasa Indonesia and Bahasa Malaysia are from the same language root. Some of the food terms are the same, few are different. Gado-gado is one of the well-known dishes from Indonesia. Gado-gado literally means “mix mix” since gado-gado is the plural word of gado, so gado-gado means mixes. 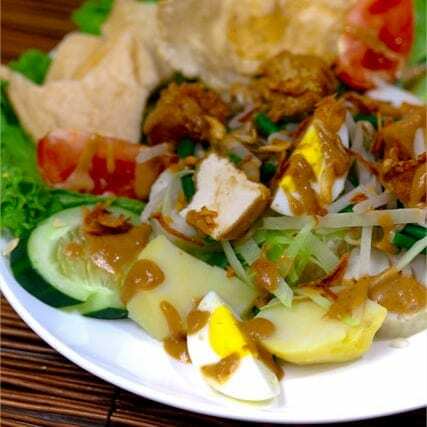 In Indonesia, gado-gado is not a salad dish group, it is a one dish meal. Speaking about gado-gado in Indonesia, several different numbers of gado-gado were developed based on the region. I was born and grew up in East Java province and I left the province for my school to West Java province… this experience had brought me to taste different styles of gado-gado. In East Java (around Surabaya), we call it Gado-gado Siram or Gado-gado Surabaya. Siram means pour as we order the food, the seller will place the ingredients (lontong, blanched vegetables, steamed potatoes, boiled eggs, tempe, tofu, etc.) on a plate and then pre-made gado-gado sauce is poured over, garnish with fried shallots and top with crackers (melinjo nuts and shrimp crackers). While in West Java (around Bandung and Bogor), the sellers will combine ground peanuts and spices, grind them in a mortar and pestle, add the cooked vegetables, mix them together, and transfer into a plate. Another style of gado-gado that I relish is gado-gado boplo from Jakarta. Boplo is an area in Jakarta where this style of gado-gado can be found. 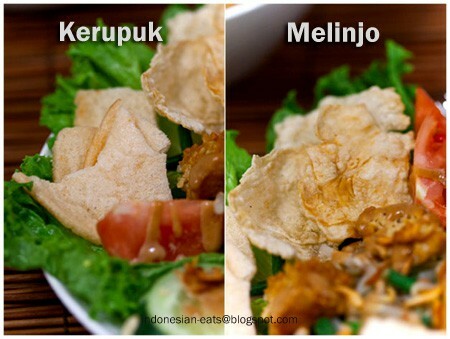 What is the difference between gado-gado siram and boplo? Gado-gado siram uses peanuts while Gado-gado Boplo uses cashew nuts. In addition, Gado-gado has carbohydrate supply from lontong and potatoes. Tempeh, tofu and eggs are the protein sources. Last but not least, the vegetables. Gado-gado can be made for pescetarianisms or pesco vegetarianisms who still consume fish and seafood; it can also be consumed by lacto-ovo vegetarians who include eggs and dairy products in their diet. Also, you can go for vegan by omitting dried shrimp paste (Indonesian: terasi/trassi, Malay: belachan/belacan) in gado-gado sauce and shrimp cracker, and skipping the egg. By leaving out the shrimp crackers, gado-gado is totally safe for people with celiac disease that can’t have any wheat in their diet. In this post, I contribute an authentic recipe of Gado-gado Surabaya or Gado-gado siram, it might be pretty intimidating with the long list of ingredients, but it will be worth it. Process garlic, peanuts/peanut butter, a half part of coconut milk, red chilies, terasi, coconut sugar in a food processor or blender. 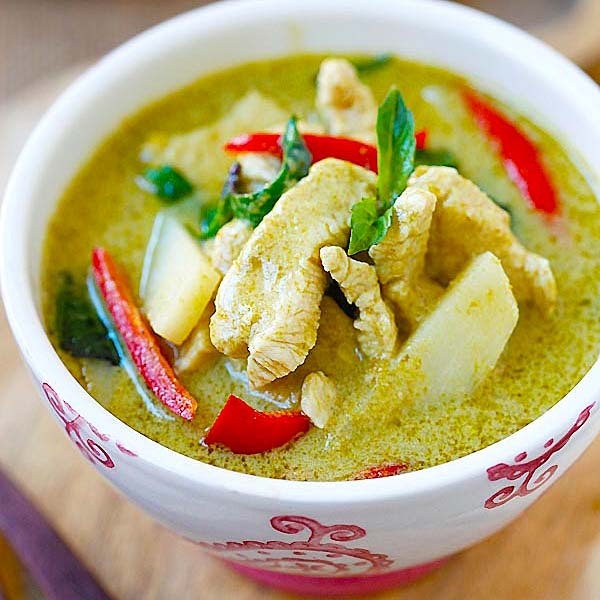 In a sauce pot, combine processed mixture with the rest of coconut milk, stir and turn on the stove at low-medium heat. Stir occasionally. Cook sauce until boiled, the volume reduced and the sauce surface looks a bit oily. Add rice flour mixture. Keep stirring until bubbling about 5 minutes. Remove from the heat. Combine all ingredients and process in a food processor/blender or you can grind them with mortar and pestle. Place lettuce, slices of lontong and boiled potatoes, blanched vegetables, wedges of boiled egg, slices of fried tempe and tofu, and wedges of tomato, slices of cucumber. 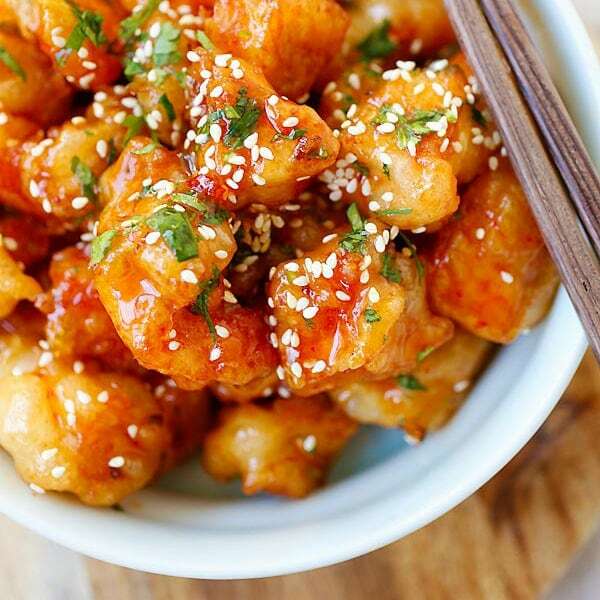 Pour the warm sauce over, garnish with fried shallot, crushed shrimp crackers and emping nuts crackers. Put sambal on the side as people has different tastebuds to handle the spiciness. You can omit the sambal if you don't like the spicy sauce. - If the sauce to thick, add a small amount of water. 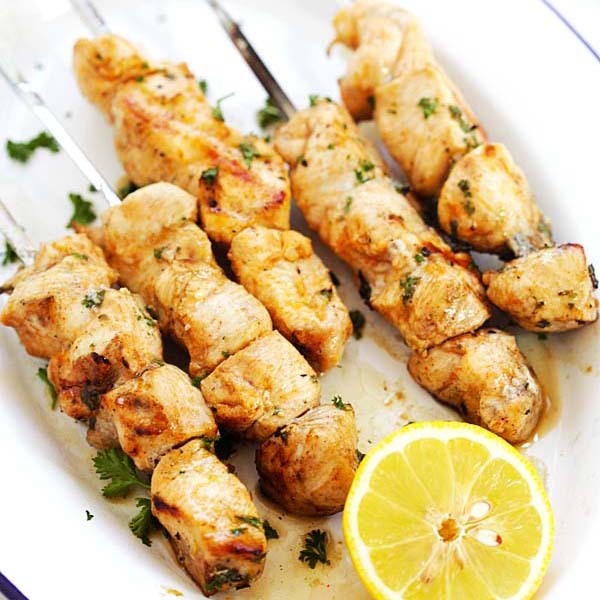 - Always try the sauce before remove from the heat, so you can add salt or coconut sugar to match your tastebuds. - Serve gado-gado sauce while it is still warm. Warm up the sauce if it is cold. - If you still have leftover sauce, keep it in a jar and refrigerate/freeze. You may use for other dipping purposes. Wow this is cool. Was just only thinking of making some… but something like tauhu sumbat. :-) Yummy! HOw come there is no “jump” link? MMmm I love gado gado, but have never attempted it at home because of all the components. Thanks for your run down on the various styles and for your recipe! I absolutely LOVE Pepy’s blog. Wow, I didn’t know that gado-gado is so complicated to make. I just know how to eat and don’t know how to make. Hehehe. Now I have a reliable gado-gado recipe. I can’t wait to impress my Indonesian friends! I first tasted gado-gado at a conference in Bogor–it was so good! Thanks for the recipe! This is so delicious and best of shoots! Looks really delicious and the sauce sounds yummy! I'm a great fan of your blog. Everything looks very nice & yummy!!! I’m a great fan of your blog. Everything looks very nice and yummy!!! I love these Indonesian Gado Gado. Simple yet rich and diverse in many ways. Thanks. Yum! Something I’ve been wanting to make for ages. Best with the original gado gado sauce from medan! (made from my auntie)THanks for sharing! @ Sunkid: I haven’t tried gado-gado Medan before. I should be shame as Medan is a city where the family of my father’s side came from. Let me know how gado-gado Medan is. @ Worldwindows: Hopefully, you enjoy this recipe. @ Pigpigscorner: You should give a try one day. @ Bits of Life ‘n’ Taste: Thanks! @ Ann: Bogor has lots good food too. It was a city where I lived for 7 years. I do love and miss that city so much especially the rainy weather. @ Passionate Eater: Wow.. Best of Luck! @ Rose: Yes, indeed! Neither did I until I lived in Bogor and knew how to make Gado-gado Bogor which is much more simple. @ Marc @ NoRecipes: :) That’s why I usually make in large batch and keep the sauce in the freezer. Whenever I want, I just pull any vegetables out from my fridge. @ MyF:: You should teach me how to make tauhu sumbat. This looks so good. I have yet to find good gado gado here in LA. I miss my gadox2 boplo from Jakarta! FYI my hometown is surabaya, but never try to make it by myself..ONLY BUY IT from the restaurant!! Thanks for the recipe. However I’m not sure where you get the “mix mix” translation for “gado-gado”, because “gado” does not mean “mix” in Indonesian. The introduction and recipe are written by a native Indonesian…I am not sure what gado gado means. it is a nice dish that you offer .i made it for the guest who gave a good comments.thanks for your hard working . seperti ingin kembali ke rumah. WOW! I made something like this, but I’m living in Egypt and had to substitute SO much, that I think I need to remove the name gado-gado from the blog…anyway, i kind of just made a beautiful salad, some rice vermicelli noodles and tossed it in the sauce. But next time I’ll try this because I bet it will add the special something! and i love all food that combined by peanut sauce, such as pecel, karedok, and lothek. just cook the vegetables 5 minutes into the boil water, and dressing with a peanut sauce. what a healthy food. but also need an attention for a peanut allergic. Rasa, question – while the vegetables are steamed or fried, is the dish served warm, or cold, or room temperature? And, can the component parts be cooked in advance and assembled a few hours later, or should it all be freshly cooked? If Lotong is not avaiable, would there be a suggested substitute,or best to just leave it out? Yes, you can the dish should be served room temperature. Yes you can cook in advance.